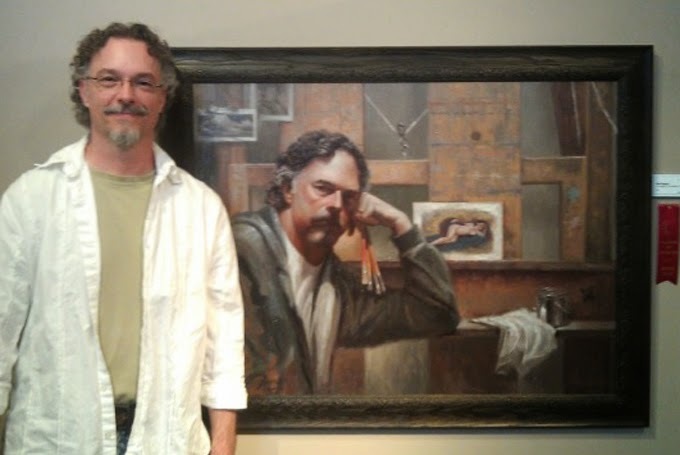 Artist Richard Stergulz poses with his award-winning self portrait painted in oil on Masonite. Murrieta resident Richard Stergulz will be the featured artist at the Anza Valley Artists Spring HeART of the High Country show and sale on April 25. Stergulz paints in oils on Masonite board and his work is mostly figurative. His works hang in galleries in Santa Monica, Idyllwild and Vista. Numerous paintings have won awards, from Best of Show to People's Choice. Stergulz is a native of Illinois who said he knew by age 8 he wanted to be an artist. He graduated from the American Academy of Art in Chicago in 1983. After 12 years of doing commercial art, he moved to California in 1995 and started painting for himself in a realistic style with a touch of Russian impressionism. "I admire the Russian Impressionists, especially Nickolai Fechin, for their intense brush strokes that exude passion into their paintings," he said. "I also admire Norman Rockwell for his amazing drawing ability and the volume of work he produced in his lifetime." The show will be held from 9 a.m. to 4 p.m. April 25 at the Anza Community Center on Highway 371. For information, contact Jill Roberts at 858-774-5855.